The scene, featuring a view of Christopher Wren’s St Paul’s Cathedral as it appeared in his early plans, was offered at Bellmans of Wisborough Green, Sussex, on April 5. Printed on four numbered sheets and now mounted on linen, Londinium Florentissima Britanniae Urbs, Emporiumque Toto Orbe Celeberrimumwas published by Frederick de Wit in c.1683. The 2ft x 6ft 11in (59cm x 2.12m) engraving is a curious mix of the new and the old of Stuart London. De Wit (1630-1706) had printed his first panorama of the city in c.1650, largely copying an earlier view first published by fellow Amsterdam engraver Claes Visscher (1587-1652). Only a handful of copies of this state are known including one in the British Library and another once owned by Samuel Pepys now in Magdalene College, Cambridge. 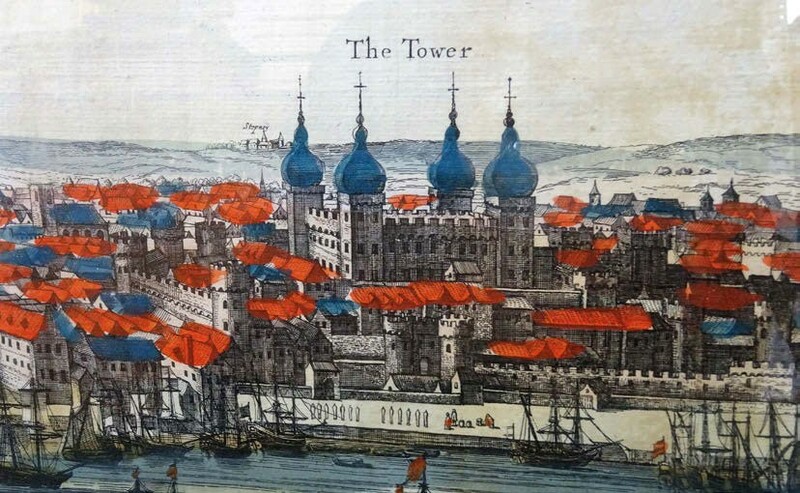 However, following the devastation wrought by the Great Fire it seems de Wit and his assistants felt obliged to rework elements of the original copper plates to include at least some key elements of a new skyline on the north bank. The accompanying text penned in English, Latin and Dutch in ‘the present year 1683’ describes the rebuilding of the city ‘in a far more magnificent manner than before, so that it exceeds most Buildings, and all the Exchanges in the World’. 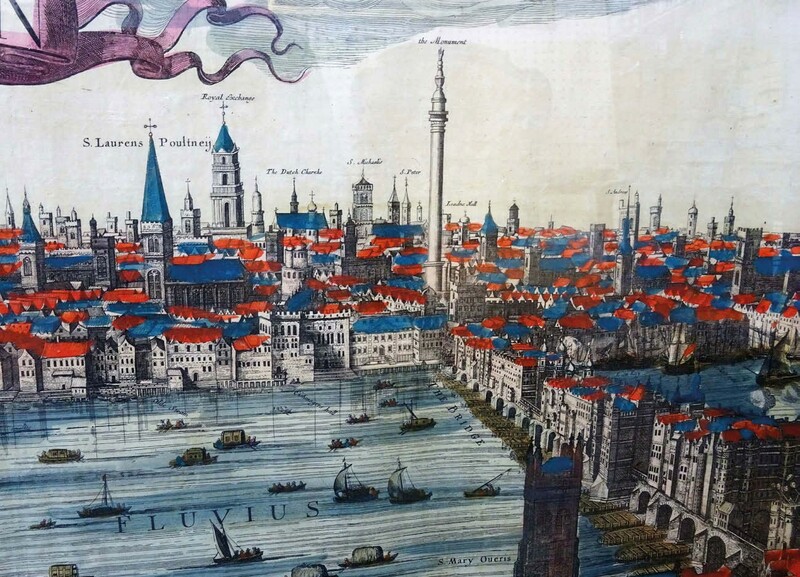 It is quite possible that the artist had never visited London – hence the inclusion on the South Bank of buildings that had disappeared many years prior to 1666. In the foreground, for example, stands the Globe Theatre, pulled down in 1644. However, among the new buildings in this 1683 state are the Royal Exchange, the Monument, some of the Wren churches plus St Paul’s as it appeared in architectural plans of the 1670s (but not as completed in 1710). The panorama – a previously unrecorded survivor and perhaps the only known example with its original colour – came for sale from a private vendor with little extra information regarding its purchase history. The winning bid, many times the estimate of £4000-6000, was a house record for Bellmans’ book department. A 22% buyer’s premium was charged. 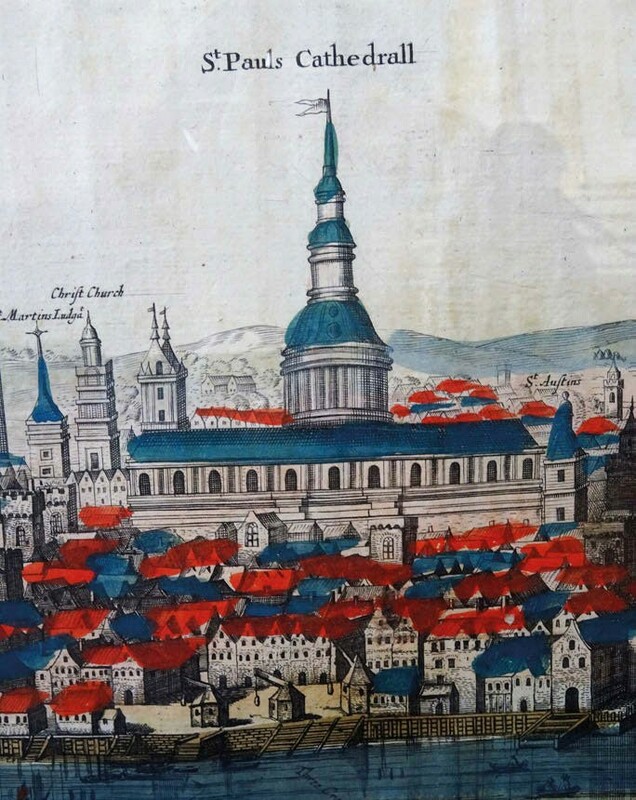 In July last year Christie’s sold an exceptional copy of Visscher’s panoramic view of London before the Great Fire, one of only two known copies of a c.1625 edition, for £85,000.